In the 20 year history that I have been working in this industry, if there was one product that caused confusion or that a client misunderstood, it was always in the annuity realm. When you break them down and begin to understand the nuts and bolts, they're not all that difficult. Our goal is for you to leave knowing more than you did previously, and whether an annuity should be considered, or not, depending on your individual needs and desires. 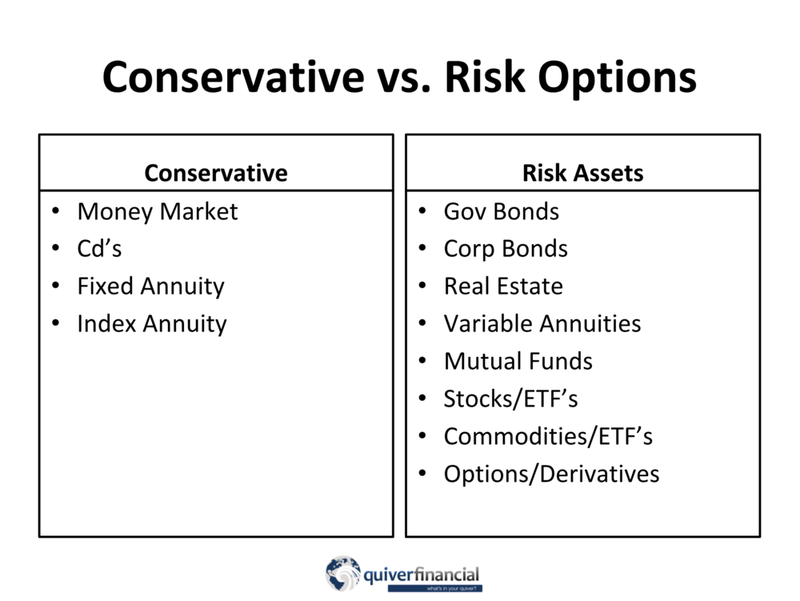 In today's discussion, we will go over the conservative versus risk options in the investment world. We break it down in this way, because when you go to invest, you have different products, some are for more conservative minded investors and some for more risk minded investors, and we need to know where annuities fall on this spectrum to know if they are right for you. Conservative investments are someone that prefers to not see too much change in their account value, and can't or don't want to lose any money in their investments. My grandparents were like this. They went through the Depression, and they didn't trust the stock market. So, my grandparents invested in things like CD's and Money Market. When they retired in the early 70's they had an advantage that we don't. They retired at a time that interest rates were much higher. Money Markets today pay around 1% nowadays. CD's are around 2-3% now. Considering taxes and inflation, these numbers are pretty low for most people. That is why people will look into Fixed and Index annuities, because like a CD you are putting your money aside for a set period of time, but instead of investing it at the bank, you are investing it in the insurance company. For most Fixed Annuities right now, the rates are around 3%. Index Annuities were created to provide some exposure to the market gains, while still protecting you from losses. They have a cap, a maximum that they can earn in a year, so they do not match the market, but rather loosely correlate to the direction of the market, at a lower rate of return. For many investors that are looking for ways to have exposure and growth from the markets, but can't risk dropping below their principal investments, Index Annuities may be an option for them. Risk and reward is a common saying, and you could apply this statement to the markets. There is typically a higher potential reward when you are willing to take more risk. For investors that need returns that are greater than which you can find in the "conservative" investments, then they may need to start exploring their other options, and potentially riskier assets. I have organized these from what I feel are lower risk to higher risk. The "conservative" asset of bonds is becoming a riskier asset. In an environment where interest rates start to rise, these can cause a lot of havoc in your portfolio, which is why I have placed them on the right side of the chart. Real Estate is pretty straight forward, and I am sure most of you are familiar with that, so we won't spend much time on that subject. 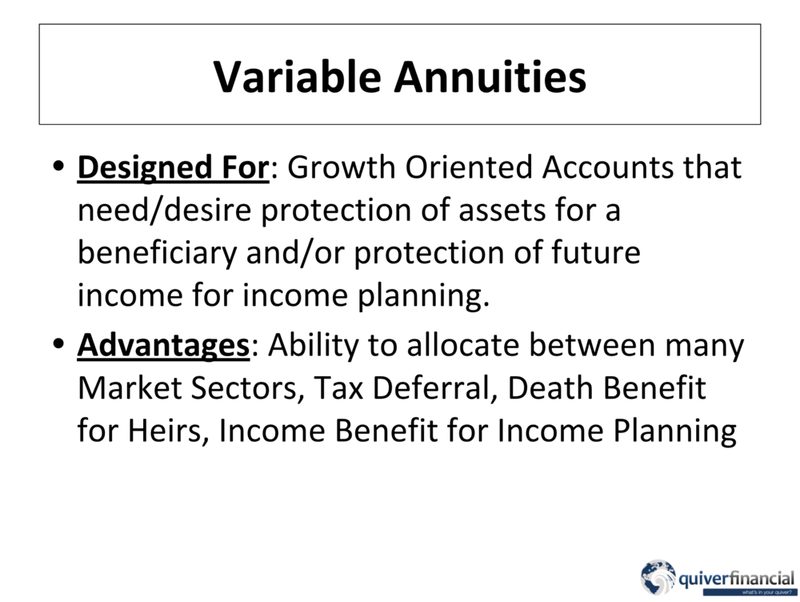 We will be diving deeper into the details of Variable Annuities a little further along in the presentation. Mutual funds, stocks, bonds, ETFs all experience market volatility. Commodities and options are basically only for very experienced investors. Investors should exercise caution when considering investing in these last investments, and always talk to your advisor to see if an investment is suitable for you. Annuities have Tax Deferral. We call it the 8th Wonder of the World, because tax deferral allows your money to grow at a faster pace. It helps compound an account faster. Most retirement accounts are tax-deferral focused. The whole purpose of annuities are to help you like a pension would, to set up an income you won't outlive. Some annuities provide a death benefit, which is there for your beneficiary to ensure an efficient transfer to your heirs upon your passing. Annuities are often used by people in retirement, or planning on retiring. This chart is of the S&P 500 from 1999 to 2013. I chose this timeframe, because if you retired and entered the market anytime in this red box, you spent most of your time in the markets in recovery mode. Most people don't retire when we are in a slump, when 401ks and house values are at extreme lows. Many times, if people aren't forced into retirement, they will keep working until they feel comfortable enough with their savings to step away from work. 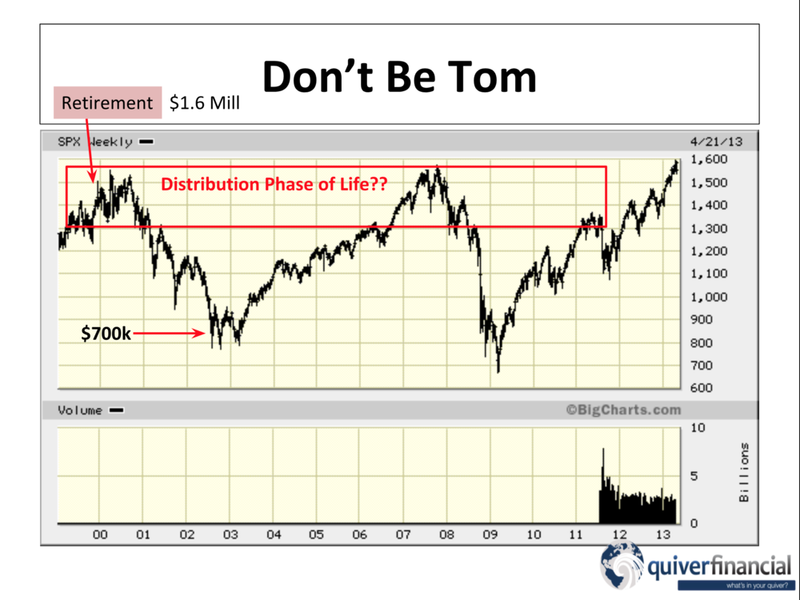 So, the idea with annuities is that if you happen to go into the distribution phase of life near a market top, maybe it can help you offset some of the potential risks involved with market cycles. Variable Annuities are growth oriented accounts. A variable annuity gives you the ability to diversify your money between different market sectors or different mutual funds. Think of it like a 401k, where you would have 20-30 different investment options, a variable annuity works pretty much the same way that you can invest the money you have in it in these different investment options. They provide tax-deferral, and often times provide an optional death benefit for your heirs or spouse. They also have income benefits that help people plan for future retirement income. Think of it like an M&M. 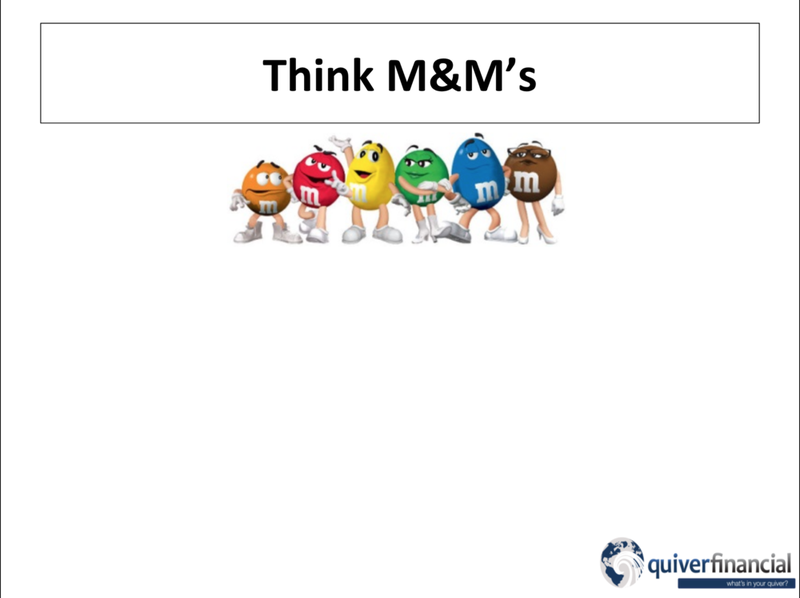 A variable annuity is similar to an M&M. What's an M&M? A hard candy coating around chocolate- so that it melts in your mouth, not in your hand. The candy outside part of the variable annuity is the insurance benefits. These are usually in the form of a death benefit, and the optional income benefit. Inside the M&M, the chocolate part of the variable annuity, is Mutual Funds. Some variable annuities have more Mutual Funds than others, so that is where you do your shopping around to see what product you prefer. The limits to what you can invest in within these variable annuities is set by the annuity company. You have to remember that there are certain advisors like myself that are able to work with many different companies, and help you choose the best product for your needs, and other times there are annuity salesmen that are married to one company, and are unable to give recommendations outside of their one brand. Here is a real life scenario. Tom was a client that I started talking to in 1998. In 1998-2000, the NASDAQ was doing really good. Tom worked at a company called Qualcomm, that was doing very well from a stock prospective. He was looking at his 401k, and he realized he had 1.6 million dollars. Between his 401k, and his house value, he was feeling pretty good. He thought to himself, "You know, if I took 70-75k per year, I could live on that and retire at 55." When we has making that choice, I met with him and he was meeting with Merrill Lynch but ended up deciding to go with Merrill Lynch because they were a bigger firm. They allocated him in everything that was Janus Mutual Funds and NASDAQ oriented. We went through this timeframe where the Dot Com market bubble burst. During this time he was taking a withdrawal of 75k per year. What do you think his account value was here? It was just above 700k. Now, Tom started reaching out to me again, and when we sat down, I told him that had he taken my advice he would have been more protected with a variable annuity, due to the income benefit rider. Regardless of what happened in his account value, he still could have kept taking the same income. $80k per year off of $1.6 million is 5%; $80k per year off of $700k is closer to 11%. Tom took on all this loss from the market, which means to maintain the same income, he would need to take bigger market risks to make returns of at least 11% per year to keep his income up. He ended up lowering his income and selling his house- he had to make life changes because the timing was bad. I am not saying that the account value of the Variable Annuity would have done better, but at least the income would have been there until Tom died. He would have been able to maintain the same lifestyle, even if the money inevitable ran out. Another common optional benefit of annuities is the Death Benefit. Here is how it works. The standard death benefit in a VA is set initially at whatever amount is invested. Then, depending on VA, the death benefit resets on either the contract anniversary date if the contract value has increased or whenever the contract cash value reaches a new high. Once set, the death benefit does not decrease if the contract declines in value. However, the death benefit does decrease if the contract owner takes a distribution. Many contracts also offer an enhanced death benefit rider that can be purchased for an additional fee of around 0.5-1.0% of the contract value. The additional fee is charged each year. Enhanced death benefits vary, but many contracts offer an annual guaranteed step up. For example, the contract may guarantee the death benefit will increase by the greater of 5% a year or reset to the highest contract value. Over time, it is not unusual for a VA to end up having a death benefit that is higher than the actual contract surrender value. The main design of this rider is to protect your beneficiaries whether the market goes down after you started investing, or locks in your earnings in the event that the market dips after a good year. When the market is high, everyone thinks it will continue forever- but it doesn't work like that. The times when I see that Variable Annuities are most beneficial, it is when you have very lofty and extended markets. They help to provide risk protection while still being designed for growth. One thing investors need to understand is that most annuities have surrender charges, which is like an early withdrawal fee. Surrender charges are different per company, and usually are anywhere from 5-9 years. For the lifetime of the surrender charge, they allow you usually to take up to 10% without any fees, but if you withdrawal more than that, you are assessed a surrender charge. It steps down year after year, so the longer that you own the variable annuity the lower the surrender charge is until the timeframe of 5 to 9 years is up. These are retirement oriented accounts, so most people do not go into them with the intention of withdrawing more than their required minimum distribution, which I have never seen be more than 10% of an account value, it's usually around 4%. Variable annuities can be expensive- the Mortality and Expense ratio can be anywhere from 1-1.5% per year to provide tax deferral and the death benefit. The income benefit rider can be around 1% as well. The agents that sell annuities also make a commission. These accounts can cost you anywhere from 3-3.5% per year, which is why these accounts are meant to be focused for growth. Also, if you are paying for benefits that you will never use, such as an Income Benefit that you don't need, then it can cost you more than you really need to pay. So here are some scenarios. Some people that may choose a Variable Annuity to help make sure that their spouse will receive income after their death. They could be for someone that wants to go for growth but wants something that protects their income or their beneficiaries once they pass. For people that may have more money than they will ever use, they could use a Variable Annuity to focus on growth and pass the maximum amount to the heirs. Some people use it to control from the grave, so that your child or beneficiary doesn't spend all of the money at one time. It is always prudent to speak with an independent advisor or agent before choosing an annuity, because like I mentioned before, certain insurance agents are married to one company and likely will not have as many options to choose from. When shopping for annuities, it is best to look at all of the options, and really understand what you plan on using them for so you do not incur unnecessary costs for benefits you may not use. Fixed Index Annuities have two components: Cash Value, and Income Value. The design of the product was to give you a percentage of growth from the markets, while not exposing you to the risk of the downsides of the market. Almost all companies have a cap rate. Right now they are fairly low, at 4%. Cap rates tend to be low when interest rates are low. If your earnings are tied to the S&P 500, you will earn growth up to your cap rate in positive years for that index. If the market went up 10% in one year, your growth rate will be 4%. In the years that the market goes down, your account value stays even and doesn't take on losses. People go to these products, because they want it to feel like a bank account, where they open their statement and it stays the same, or it is slightly higher. These accounts are for people that prefer safety over growth. For people that need to take income down the road, you can pay a little extra for an income rider that has a set guarantee. Most companies are at 6% right now. So if you start with 100k and have it in an account for 10 years, every year you are going to have two numbers on your statement: Cash Value and Income Value. Over ten years, because of the markets ups and downs, your cash value may only be 150k, but the income value may be up closer to 200k. These are best designed for the person that needs some guarantee of income in the future. They are low maintenance, and provide tax deferral. These are good for investors that don't want to see losses in their account. If you don't need the income guarantee, do not buy this rider. You usually have to pay extra for it. With Index annuities, you don't have the mutual fund manager fee, nor the M&E cost. 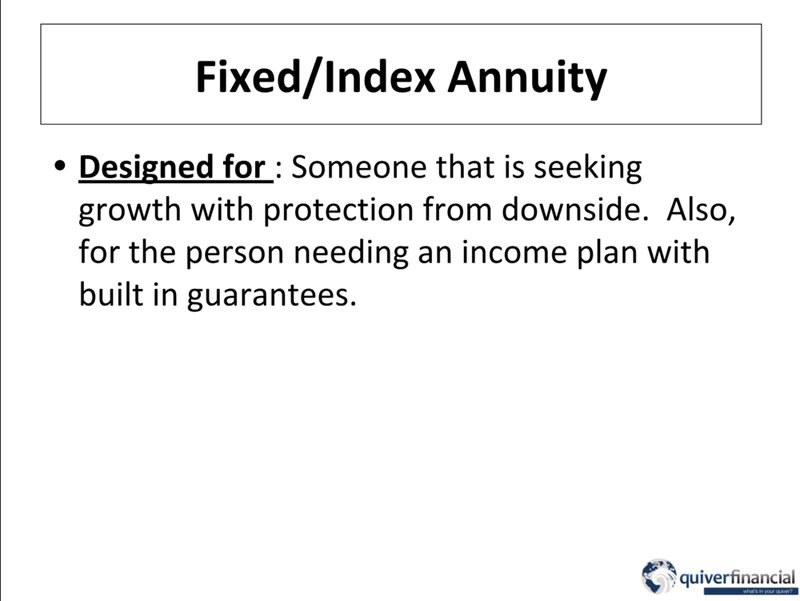 The one optional fee for Index annuities is the income rider, but the one thing I see is people that buy this rider and don't use it, and it ends up being a waste. Like variable annuities, there are surrender charges if you withdrawal over 10% before your surrender period is up. These accounts may be for people that think the banks CD rates are too low. Also, it helps protect someone from overspending each year. There is very little mail and maintenance involved with these accounts. When you are retiring and you still need your money to grow, but you need certainty in your income planning, these can be a tool that you can use to help with that. Some people use these products to allocate for future health care costs. Sometimes people will put a certain dollar amount here to grow over time at a certain rate so that the money will be available in the event that you need to pay for future health care costs. If you don't ever use it, then the money will go to your heirs.